This post will cover the basics of system configuration along with some security such as adding user names but also more advanced features including control plane filters. exit drops you back to your previous level of the hierarchy, exit all brings you back to root and back moves you back up one level of the hierarchy. Typing info will show you configured commands within your present working context, which itself can be viewed with pwc. Using info detail will show all commands in the pwc including defaults, a very useful one! As mentioned in my previous post / allows you to parse a command that would otherwise not be available. info | match post-lines 10 address will show you the subsequent 10 lines of config if ‘address’ is matched. Both the pre and post line match commands are very useful for locating config lines in large files. I frequently see files with over 10,000 lines of config, a downside of the granularity of SROS. info | match "address 10" will show you anything with address 10 in the line, such as all network 10 addresses configured. A:7750# configure system name "pe1"
*A:pe1>config>system# location "In a rack somewhere"
*A:pe1>config>system# contact "NOC @ 1234567890"
*A:pe1>config>system>login-control# motd text "This is my router"
*A:pe1>config>system>login-control# pre-login-message "Unauthorized access prohibited"
This is pretty straightforward telling the router to use tacacs+ followed by local auth. Should authentication be rejected exit back to the login prompt. *A:pe1>config>system>security>tacplus# server 1 address 10.12.13.14 secret "mysecretfor1"
*A:pe1>config>system>security>tacplus# server 2 address 10.12.13.15 secret "mysecretfor2"
You can configure stuff for the SAM5620 manager but I won’t go in to hit as I don’t have a test SAM server. CPM filters are what protects your processor and it’s protocols for being compromised, such as OSPF neighbours from a specific subnet. These are not available on the SR1. Extreme care should be take as no-shutting the filters before allowing your own access method can disconnect you from the chassis, and there is no remote way to fix it without out of band. In this section we will configure basic SSH access control and OSPF. You should configure all your protocols to be permitted where required and only no shut the CPM filters when you have permitted your own access, e.g. a SSH filter permitting a source subnet you are on. I will post something on CPM protection when I dabble in it, it’s on my list of ‘to investigate’. The last thing I want to mention under the configure system banner is the chassis mode. This controls service resources including FIB sizes and can be A, B, C or D. The SR1 supports mode A only which is somewhat limited. That’s it for this post, the next ones will relate to actual network build. 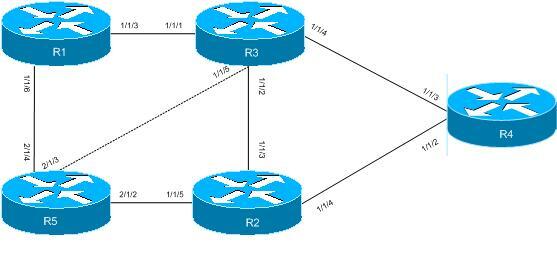 I will do up a Visio with the topology and start at bringing the physical network up.